After eight weeks on the top 100 British pop albums tally, Dolly's Better Day this week drops off that chart, down from No. 87 the previous week. However, the CD loses just one spot to No. 3 in its ninth week on the U.K. country albums list. On the British country compilation chart, Dolly: Live From London rises four to No. 14 in its 85th chart week. In Australia, Better Day gains seven spots to No. 13 in its sixth week on the top 20 country albums chart Down Under, while The Very Best Of Dolly Parton, Volume 1 rises two places to No. 8 in its 86th chart week. Webisode 13 of the series in advance of next week's launch of the Australian leg of Dolly's Better Day World Tour premiered Sunday, focusing on Dolly's tour bus. Check it out in the media player above or by visiting YouTube here. Next week's segment will provide an overview of her current live show. Dolly and Queen Latifah performed their Joyful Noise single at the How Sweet the Sound gospel music competition in Los Angeles, which was noted (complete with a photo) on the Los Angeles Weekly blog here over the weekend. I'm also told that the concert will air on Gospel Music Channel Dec. 3. As was previously reported here, their song "He's Everything" was released last week. As was previously reported here, the first single from Dolly's upcoming movie with Queen Latifah, Joyful Noise, was released on Friday. Turns out the song was "He's Everything," the Dolly-penned track that it was also previously reported here that she and Latifah were scheduled to perform on Friday night's How Sweet the Sound gospel choir competition in Los Angeles, which was noted on Eurweb here. The 5-minute track is listed as "Queen Latifah, Dolly Parton, Keke Palmer, Jeremy Jordan, Andy Karl and Dequina Moore," but the track features Dolly's vocals much more prominently than any other artist on the song. It became available for download via iTunes here on Friday. Some behind-the-scenes video of Dolly's Better Day World Tour made it to the Web this week courtesy the Talent In Borders blog here and noted on Examiner here. After a month-long absence from the American music charts, Dolly's Better Day returns this week, likely due to coverage of the second American leg of her Better Day World Tour. The CD comes in at No. 50 for a 13th week on the country albums chart, the Nov. 5 Billboard numbers released Thursday revealed. Also in the publication, its Boxscore of concert receipts showed Dolly's Clearwater, Fla., engagement on the tour as the 46th-highest grosser of the week with all 2,114 available seats sold out and $229,518 in ticket sales. In other chart developments, Chicago's O Christmas Three, featuring a Dolly duet on Paul McCartney's "Wonderful Christmas Time," slips four places to No. 11 holiday albums in its third week, while Dolly's 1984 collection with Kenny Rogers, Once Upon A Christmas, gains nine spots to No. 28 holiday albums in its 33rd week on that chart, its second week of the 2011-2012 holiday season. Kristen Chenoweth's Some Lessons Learned, with her cover of Dolly's "Change" and the tribute song "What Would Dolly Do?," falls a dozen digits to No. 71 in its sixth week. The Grascals' Country Classics With A Bluegrass Spin, featuring three Dolly guest appearances, gains one to No. 9 bluegrass albums in its 36th chart week. Overall, Scotty McCreery�'s Clear As Day remains steady at No. 1 country and rises one to No. 3 pop with 57,000 units sold in its third chart week, while Lady Antebellum's Own The Night regains one to No. 2 country and No. 7 pop with 34,000 copies moved in its 33rd week. After a rough cut of a new video for Dolly's current single "The Sacrifice" from Better Day became publicly available via Vimeo on Wednesday and began circulating on this site and social media networks, it was restricted Thursday to password protected viewing only, making it no longer publicly available. However, the video on Thursday once again became publicly available with its posting to gossip site Perez Hilton here, also viewable in the media player above. Contemporary Christian group Selah, who had previously recorded a duet with Dolly on her "Once Upon A Christmas" on their holiday album Rose of Bethlehem, have covered her "Coat of Many Colors" on their recent CD, Hope of the Broken World. CCM Magazine will post a video of singer Allan Hall performing it live here. Dollywood is prepping for the return of its annual Smoky Mountain Christmas festival, which kicks off a week from Saturday. This year's event, which runs Nov. 5 to Dec. 30, features the premiere of a new show in DP's Celebrity Theatre, Dollywood's Christmas on Ice. In a press release, Dolly said: "My new Dollywood's Christmas on Ice show is filled with some of my very favorite Christmas songs, beautiful costumes and incredibly talented ice skaters. It's the first ice rink we've ever created at Dollywood, and I just can't wait for folks to see all the unbelievable twists and spins, along with, of course, the entire park that's filled with all of the many wonderful sights and sounds of Christmas!" The original show features the Ice Theatre of New York and six singers performing several traditional holiday favorites. Lily Tomlin had lots to recall about 9 To 5 when discussing presentation of a lifetime achievement award from a local film festival, The Savannah Morning News reported here. A rough cut of the new music video for Dolly's current single, "The Sacrifice" from her Better Day album, was released on Wednesday. It features a significant amount of archival footage from Dolly's career and childhood, including several images of her late parents. Watch it in the media player above or by visiting Vimeo here. The promoters for the upcoming Australian leg of her Better Day World Tour on Tuesday released the next installment of their web series on Dolly and her career. This one featured her insights on touring. Watch it in the media player above or by visiting YouTube here. 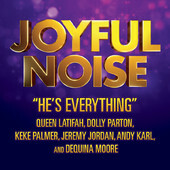 The first single from Dolly's upcoming film Joyful Noise will be released on Friday, the same day she and Queen Latifah perform the Dolly-penned track "He's Everything" from the film at the How Sweet the Sound gospel competition in Los Angeles, the film's music producer, Mervyn Warren, has revealed on his personal Facebook page. He also says the likely release date for the project's soundtrack album is Jan. 10 and at least two and possibly three singles will be released prior to the film hitting screens on Jan. 13. No word, though, on which song that first single will be. He also noted that the DVD 'extras" have also already been completed including a scene featuring a song he wrote that was cut from the final version as well as a deleted rehearsal scene. Thanks, Tony! Broadway legend Carol Channing will be signing copies of her two latest albums, True To the Red White And Blue and For Heaven's Sake Wednesday at 7 p.m. at the River Oaks Barnes & Noble in Houston, Texas, I'm told. No personal memorabilia, as she will only be signing those two items. Dolly back-up singer Jennifer O'Brien sings on both projects, while fellow Dolly back-up singers Vicki Hampton and Richard Dennison also perform on the new patriotic CD. Dolly's "Jolene" has been named by Time as one of the 100 "most extraordinary English-language pop recordings" since the magazine began publication in 1923. It was one of just eight country tunes on the list, which did not rank songs in order. (The others were George Jones' "He Stopped Loving Her Today," Loretta Lynn's "Coal Miner's Daughter," Patsy Cline's "Crazy," Johnny Cash's "Folsom Prison Blues," Kitty Wells' "It Wasn't God Who Made Honky Tonk Angels," Hank Williams' "Cold, Cold Heart" and The Carter Family's "Wildwood Flower.") In the story here, the reviewer noted: "Unlike most songs about no-good, cheatin' spouses, this one is neither angry nor resentful. There's no accusation, no vow to enact revenge. It's about two women: the mistress who has the trump card and the fragile wife who is begging her not to play it." Dolly's Better Day continues to sell well in the U.K. and re-enters the chart Down Under, the numbers from this weekend confirmed. In Great Britain, the CD slips a dozen digits to No. 87 pop but remains steady at No. 2 country in its eighth chart week there. On the British country compilation chart, Dolly: Live From London loses five to No. 18 in its 84th chart week. In Australia, Better Day re-enters the country top 20 at No. 20 to mark a fifth week, while The Very Best Of Dolly Parton, Volume 1 rises eight spots to No. 10 in its 85th chart week. In Ireland, Life In Music Ultimate Collection falls back out of the top 100 pop albums tally, down from No. 98 last week, its 11th on the list. They're prepping for her Better Day World Tour to head Down Under, with coverage over the weekend from The Daily Telegraph getting excited about the tour here and The Herald Sun here. Stateside, thanks to Chuck for pointing me to a gallery of shots from the last date on the second American leg of the tour from last week's Hollywood, Fla., show in South Florida Country Music here. While in Nashville for a concert last week, R&B queen Aretha Franklin chose to end her concert with a Dolly standard: "I Will Always Love You." Check out audio via YouTube here. Baton Rouge is getting Dolly's Imagination Library literacy program, The Advocate reports here. Kristen Chenoweth's Some Lessons Learned, with her cover of Dolly's "Change" and the tribute number "What Would Dolly Do?," dips another 13 places on the Oct. 29 Billboard country albums chart released Thursday to come in at No. 59 in its fifth week. The Grascals' Country Classics With A Bluegrass Spin, featuring three Dolly guest appearances, rises three to No. 10 bluegrass albums for a 35th chart week. Overall, Scotty McCreery�'s Clear As Day remains steady at No. 1 country but falls three to No. 4 pop in its second chart week, while Lauren Alaina's Wildflower debuts at No. 2 country and No. 5 pop. With the demise of Sha-Kon-O-Hey! Land of Blue Smoke at Dollywood, The Mountain Press lamented the show's closing in an editorial Thursday here. A "Save Sha-Kon-O-Hey" Facebook page begging the park to bring the show back launched this week, changing its name Thursday to "Save the Show" before disappearing all-together. Wonder what Ron Leibman, "Freddie Ugo" in Dolly's Rhinestone, thought of Dolly in the film? And what he thought of the Stallone-rewritten script? He says it in an interview with AV Club here. Nearly two weeks after the show's closing was first reported by Dollymania.net, the local press around Dollywood on Tuesday noted that Wednesday is the final performance of the park's beloved musical Sha-Kon-O-Hey! Land of Blue Smoke featuring original music and lyrics by Dolly. Read more from The Mountain Press here. The piece quoted a park spokesperson as saying: "We're going to be doing some different things next year with that venue and with our overall entertainment offerings. We will be announcing fairly soon all our plans for the summer." Sounds like something other than a new permanent show will be going into DP's Celebrity Theatre in 2012 � perhaps a return to the celebrity concert series of old? 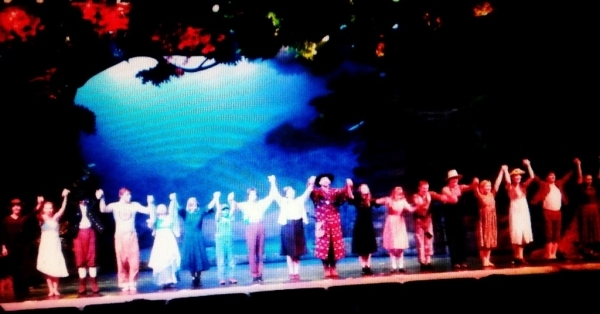 Thanks to a fan for sending in the cast picture at left from Tuesday's curtain call of the show. Click on it for a larger view. In other Dollywood news, the continuing construction of the massive Wild Eagle roller coaster attraction gained a video profile in Nashville's The Tennessean here this week. The Tennessean also noted that the Nashville affiliate for Dolly's Imagination Library literacy program on Tuesday celebrated presentation of its 2 millionth book since inception with a ceremony featuring First Lady Crissy Haslam. Read more here. Thanks to Solomon for alerting me that The Barter Theatre in Abingdon, Va., has also signed on to stage a production of Dolly's 9 To 5: The Musical. The Washington Times reports here that they hope to lure Dolly to see the show there, which opens Feb. 23. Dolly CD Still High In U.K.
Dolly's Better Day sticks around this week on the top 100 British pop albums tally and the top 20 country albums list, although it failed to recapture the No. 1 country spot it held for five consecutive weeks there. The CD remains at No. 2 country for a second week behind last week's No. 1, Lady Antebellum's Own The Night , to log a seventh chart week across the pond. On the pop side, it slides 10 places to No. 75. On the British country compilation chart, Dolly: Live From London slips three to No. 13 in its 83rd chart week. Down Under, the compilation The Very Best Of Dolly Parton, Volume 1 re-enters the top 20 Australian country albums chart at No. 18 for an 84th week. The brief second American leg of Dolly's Better Day World Tour comes to a close Tuesday with its final show, the Hard Rock Live in Hollywood, Fla. The tour doesn't pick back up until Nov. 8 in Australia, where the next installment of the tour promoter's Dolly Tour TV was not available yet as of press time Sunday night. The first 10 episodes premiered on Sundays U.S. time, but the 11th (available on YouTube here) wasn't streaming until Tuesday last week. Another city has signed on to produce its own version of Dolly's 9 To 5: The Musical: Wichita, Kan. The Music Theatre of Wichita over the weekend announced it will stage a production of the musical June 27 through July 1 next year. After falling back out of the top 100 pop albums chart for one week in Ireland, the Dolly compilation Life In Music Ultimate Collection this week re-entered the Irish tally at No. 98 to score an 11th chart week. Dolly To Honor Smith In W.V. Dolly has submitted a videotaped address to congratulate Connie Smith on her entry into the West Virginia Hall of Fame, The Herald Dispatch reported here Friday. Bill Cosby also recorded an address in honor of Butch Miles. Dolly's recent concerts on the second American leg of her Better Day World Tour have not been very successful, the Boxscore numbers released Thursday by Billboard magazine confirmed. Her Oct. 8 show in Tulsa, Okla., was the 68th-highest grossing show reported this week with $266,209 in ticket sales, but only 65 percent of the 6,389 available tickets were sold. Things were worse in Biloxi, Miss., which ranked 77th with $178,114. Only 50 percent of the 4,973 available tickets were sold for that show. Elsewhere on the Oct. 22 charts, Kristen Chenoweth's Some Lessons Learned, with her cover of Dolly's "Change" and a tribute number called "What Would Dolly Do?," loses 11 spots to No. 46 in its fourth week on the country albums chart, while The Grascals' Country Classics With A Bluegrass Spin, with three Dolly guest spots, holds steady at No. 13 bluegrass albums for a 34th chart week. Overall, Scotty McCreery�'s Clear As Day debuts at No. 1 country and pop, while Lady Antebellum's Own The Night slips one to No. 2 country and gains two to No. 4 pop in its fourth week. In other tour news, her Houston show earned rave reviews from The Houston Press here and The Houston Chronicle here, while her upcoming Sarasota, Fla., concert on Sunday made Bradenton.com here. You probably first read news that Dolly's next Better Day single would be "The Sacrifice" when it was posted here Monday night, but it made the mainstream music webosphere Tuesday with issuance of a press release touting the song's shipment to radio. In the release, Dolly noted: "'The Sacrifice' is another song that is just so, totally, me. I think it's so totally everybody that has a dream and desire to be successful, and in order to be successful we have to give up things that we'd rather not.� But if we're not willing to make that sacrifice usually we don't see those dreams come true." The release generated stories about the new single from Artist Direct here, GAC here, Antimusic here and The Boot here plus a review from Taste Of Country here. In tour news, I'm told Dolly announced on stage in Biloxi, Miss., Monday night that she and Queen Latifah would promote their upcoming film Joyful Noise by singing "He's Everything" together at the Staples Center in Los Angeles later this month for a gospel choir competition. She has also revised her rap to "heavy rapping" (in other words, a "real" rap) instead of the slow little sing-songy "rap" she had done on the tour's first leg. Also, The Miami New Times previewed her Oct. 18 show at nearby Hard Rock Live in Hollywood, Fla., here, while the Tampa Bay News Weekly profiled her Oct. 15 date in Clearwater, Fla., here. Dolly appeared on NPR's World Caf� program Tuesday in an episode focusing on country and bluegrass music, although the network noted here it did not receive permission to post her segment online. Lifetime has announced it will remake Dolly's classic hit comedy Steel Magnolias updated to the current day and featuring an all-African-American cast. Learn more from Playbill here. Dolly's Tulsa stop on the Better Day World Tour got another gushing review, this one from the University of Oklahoma's student newspaper here. Also, thanks to Justin from that concert alerting me that she has replaced "In The Meantime"/"Country Is" with "Backwoods Barbie" (on which she plays harmonica) and that she is now announcing in concert that "The Sacrifice" will be the second single from Better Day. Dollywood has filed suit over the failed Timber Tower ride, demanding $500,000 in damages from HUSS Park Attractions and HUSS Parts and Services, the German builders of the attraction, according to The Mountain Press here. The ride has been plagued with mechanical failures since its opening, most dramatically a multi-hour shut-down that trapped several riders at its top. The ride has not operated at all this season, and park officials said in the report it likely will not re-open. In much brighter news, the park is planning a charity run Nov. 18, it was announced Monday. Dollywood's Light the Way 5K Walk/Run will go start at the park's front gate at 11 p.m. and go through the parking lot and then through the park itself and its 4 million lights for Smoky Mountain Christmas. Prizes will be awarded, and the $25 entry fee will support the Share It Forward program, which accepts donations from park employees that are matched by the park and used to assist their fellow workers who find themselves in financial hardship. Register to run here. After five consecutive weeks atop the country albums chart across the pond in the U.K., Dolly's Better Day meets its match this week, dipping one digit to No. 2 country and slipping 17 spots to No. 65 pop in its sixth chart week as Lady Antebellum's Own The Night debuts at No. 1 country and No. 4 pop. Elsewhere on the county compilation chart, Dolly: Live From London gains three to No. 9 in its 82nd chart week, while The Essential Dolly Parton falls out of the top 20 country compilation albums, down from No. 18 the previous week, its 28th on the tally. In neighboring Ireland, the Dolly compilation Life In Music Ultimate Collection this week falls back off the Irish pop albums chart, down from No. 88 the previous week, its 10th. Dolly's Better Day World Tour is back up and running with its second American leg. Friday night's Cedar Park, Texas, show earned a very positive review from The Austin Statesman here over the weekend. The concert was also noted in The New York Times' Texas section as one of the best opportunities for residents that weekend here. Saturday evening's Tulsa, Okla., engagement received a rave review from Tulsa World here, which also noted in a separate story here that she sent free tickets for her concert there to a retirement home's book club after they sent a letter praising her autobiography. The tour continues Monday night in Biloxi, Miss., garnering a review of her current CD from the local Sun Herald here, and Houston, Texas, Tuesday night, which received a preview from Culture Map Houston here. Across the globe, a 12th date was added over the weekend to the Australian leg of Dolly's Better Day World Tour: a second night in Sydney on Nov. 29. Dollyite pre-sales begin at noon Monday and conclude at noon Wednesday, with general public sales commencing 9 a.m. Thursday. Her Nov. 15 engagement in the city is sold out. A press release, available from Broadway World here, says it will be the final addition to the itinerary Down Under. In related news, Episode 11 of the Dolly Tour TV webisode series promoting the tour was not available as of press time Sunday night. Congratulations to Dolly fan documentary Hollywood To Dollywood for recent awards it has received from film festivals in the past few days. The picture picked up the Jury Award for Best Documentary from Memphis Outflix and the Audience Choice Award for Best Documentary from Atlanta's Out on Film. Check out singer Fiona Apple covering Dolly's "Jolene" in a recent guest spot with Watkins Family Hour (a band that includes two-thirds of Nickel Creek) here. Fans who want to take in Sha-Kon-O-Hey! Land of Blue Smoke, the Dollywood musical with original music and lyrics by Dolly written to commemorate the 75th anniversary of the Great Smoky Mountain National Park, better hurry. Dollymania.net has learned the production's curtain will fall for the last time on Oct. 19. The show, which cost $1 million to create and took five years to develop prior to its May 2009 opening, will not be returning for future seasons, park spokesperson Pete Owens confirms. It is closing a couple of weeks earlier than usual this season "to allow time for the crew to come in and to set up Dollywood's Christmas on Ice," he added. In addition, popular show Dreamland Drive-In will be marking its final season in 2012. "On a broader sense, you will be seeing exciting new productions in the next 24 months replacing both Sha-Kon-O-Hey! and Dreamland Drive-In," Owens said. "We typically introduce new shows every three to five years and that is the case with both of these shows. We love these productions and hope that the new projects our Entertainment Division is working on right now will also become favorites in the years to come." No word yet on what those new shows might be. Thanks largely to the popularity of these two shows, the park has won the worldwide theme park honor of the First Place Golden Ticket Award for Best Shows in 2009, 2010 and 2011. Also, Drive-In won the International Association of Amusement Parks and Attractions (IAAPA) Heartbeat Award in 2006 and 2008, an honor Sha-Kon-O-Hey! took home in 2009. That award recognizes the theme park show worldwide that has the greatest ability to reach the hearts of its audience. 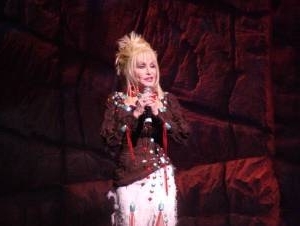 Image of Dolly at the opening night performance of Sha-Kon-O-Hey! is copyright � 2009 T. Duane Gordon/www.dollymania.net and may not be reproduced without prior written permission. Dolly's upcoming concert at Georgia's Wild Adventures theme park got more notice Thursday with issuance of a press release that noted that those without tickets may see the show as well. Although reserved seats require paid ticket purchases (and don't include park admission), those who pay park admission or have season passes will be able to access the general seating area on a first come/first serve basis. They are asked to bring their own chairs and are encouraged to stake out a spot in the free area when the park opens at 3 p.m. the afternoon of her Oct. 14 concert. Read the full press release here. The show is considered part of the second American leg of her Better Day World Tour, which gets underway this Friday night in Cedar Park, Texas. Dolly devotee Kristen Chenoweth loses 10 places on the Oct. 15 Billboard country albums chart released Thursday with her Some Lessons Learned falling to No. 35 in its third week. The collection, with her cover of Dolly's "Change" and a tribute number called "What Would Dolly Do?," drops off the top 200 pop albums chart, down from No. 125 the previous week, its second. The Grascals' Country Classics With A Bluegrass Spin, featuring Dolly on three tracks, re-enters the 15-position bluegrass albums list at No. 13 for a 33rd chart week. Overall, Lady Antebellum's Own The Night remains at No. 1 country and drops four to No. 6 pop in its third week, while Jason Aldean's My Kind of Party rebounds one to No. 2 country and falls three to No. 16 pop in its 48th chart week. Hollywood To Dollywood, the documentary about gay twin brother Dolly fans taking a cross-country road trip to place their screenplay in her hands, continues to make the film festival circuit. It plays the closing night line-up at Atlanta's Out On Film festival next Thursday night, Project Q Atlanta reported here, followed by a showing next Saturday the 15th at the Washington International LGBT Film Festival in D.C., DCist noted here. Fans waiting to get the new Dolly quotation book have another reason to do so: Dolly biographer Alanna Nash, who edited the new collection, has revealed to Dollymania.net that its her intention to use the book to help Dolly's international literacy charity. "A portion of the proceeds from this book will be donated to Dolly's Imagination Library," she tells the site. 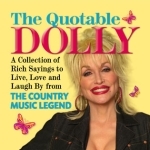 The Quotable Dolly: A Collection of Rich Says To Live, Love and Laugh By from the Country Music Legend is on sale now through the publisher's website here for $9.95 plus $4 shipping. Queen Latifah is talking up Dolly in interviews as the pair ready January's premiere of their upcoming film, Joyful Noise. In a new interview with Parade, the Queen gushes: "She is unbelievable. She's an icon. She was someone I looked up to when I was growing up mostly because we both had larger breasts in common. She was talented, she carried herself so well, she made great music, she's sassy, and she's a great actress. If there's anybody gets to be a diva it's her. But she's way down-to-earth." Read her full interview here. It's almost time for Dolly's Better Day World Tour to get back on the road. The second American leg kicks off Friday night in Cedar Park, Texas, before heading to Tulsa, Okla., on Saturday, Biloxi, Miss., on Monday and Houston, Texas, on Tuesday. The Houston Press previews the show with some Dolly praise this week here. Have A Holly, Dolly Christmas! 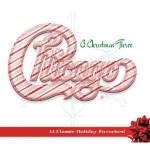 Dolly began spreading Christmas cheer on Tuesday with the release of Chicago's Chicago XXXIII: O Christmas Three album. As was previously reported, she was in the building when they were recording the Paul McCartney classic "A Wonderful Christmastime" and stopped by the studio to say hi to the band. When she heard what they were recording, she offered to sing along, and a duet was born. Also featured as guests on the CD are America, Bebe Winans and Steve Cropper. Get your copy here! Actress Rain Phoenix, sister of actors Joaquin and the late River Phoenix, and musician Jonathan Wilson have recorded a cover of Dolly's "Coat of Many Colors" that will appear on a fund-raising album to benefit The Lunchbox Fund, which purchases food for high schools in South Africa. The album, Cool for School: For the Benefit of the Lunchbox Fund, will be released by Manimal Vinyl Records as a digital release sometime this month. Check out a story on the project from Pitchfork here. iTunes allegedly charges higher prices for no legitimate reason in Australia, the nation's Fair Trading Minister complained this week, using the prices for downloads of several Dolly products from the Apple retailer, including her current album, as examples of the lower prices charged outside of Down Under. Read a story from The Daily Telegraph here. It appears from the story that Apple's spokesperson did not address the issue of music prices and instead pointed out that the company recently adjusted its App Store prices for applications to be uniform between Australia and the U.S. but not its music and movie prices. The Associated Press this week picked up on Dolly's Imagination Library adding Braille and audio books for visually impaired families and posted a story about it. Check it out from The Republic in Columbus, Ind., here. 'Better Day' Remains Top Country CD In U.K.
Dolly's current CD, Better Day, this week holds off a challenge from LeAnn Rimes to retain the top spot on the British country albums chart for a fifth consecutive week, it was revealed Sunday. Rimes' Lady and Gentlemen debuts at No. 2 country and No. 96 pop in the U.K., with Dolly's album slipping another 17 spots to No. 48 pop but remaining steady at No. 1 country. Her re-entry of "Jolene," spurred by her recent British leg of the Better Day World Tour, is over, with the track falling out of the top 100 British pop singles chart, down from No. 93 in its 11th chart week last week. On the county compilation chart, Dolly: Live From London slides five to No. 12 in its 81st chart week, while The Essential Dolly Parton rises two to No. 18 in its 28th week. The next installment in the pre-tour video series for Dolly's Better Day World Tour's Australian leg hit YouTube on Sunday, focusing on her current album. Next week's edition will profile her relationship with the country of Australia. Watch this week's in the media player above or by clicking here. In chart news Down Under, her Better Day has seen better days, with the collection falling off the Australian top 20 country albums chart after just four weeks, down from No. 15 last week. Stateside, her Better Day World Tour's second American leg is gearing up, kicking off Friday night in Cedar Park, Texas. Tulsa, Okla., is ready for her Saturday night stop in that city, with Tulsa World profiling her career achievements in a column here in advance of the show. The Dolly compilation Life In Music Ultimate Collection sticks around this week on the Irish pop albums chart, sliding three places to No. 88 in its 10th chart week. Dolly and The Grascals did not take home any awards Thursday night at the International Bluegrass Music Awards. They had been up for Song of the Year and Recorded Event of the Year for their collaboration "I Am Strong." The band had also been nominated for Entertainer of the Year, an honor that went to comedian Steve Martin. Kristen Chenoweth is playing a concert in New Jersey Saturday night, and NJ.com notes that on her country album Some Lessons Learned her Dolly tribute "What Would Dolly Do?" and her cover of Dolly's "Change" show the "connection between Parton's voice and Chenoweth's own high-pitched twang that wasn't always noticed by theater fans. But even when Chenoweth was singing under the stage lights, Parton was always there." Read the interview here.